Phoebe is a midsized irregular moon of Saturn, discovered by the American astronomer William Henry Pickering in 1899 on photographic plates and named for a Titan in Greek mythology. 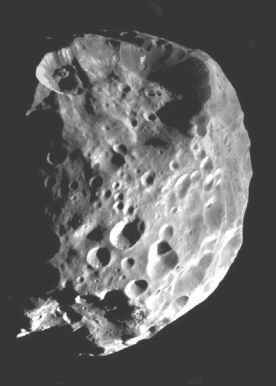 Image of Phoebe from the Cassini-Huygens spacecraft. NASA/JPL/Space Science Institute inclined to the plane of Saturn's rings and regular moons. Phoebe's surface shows large differences in reflectivity but is very dark overall. Infrared spectral observations reveal the presence of water-ice particles mixed with dark material resembling the carbon-rich material seen on primitive C-class asteroids. Some of the moon's craters show evidence of alternating surface layers of bright and dark material. Phoebe has a mean density roughly 1.6 times that of pure water ice, higher than the density of most of Saturn's icy major moons. 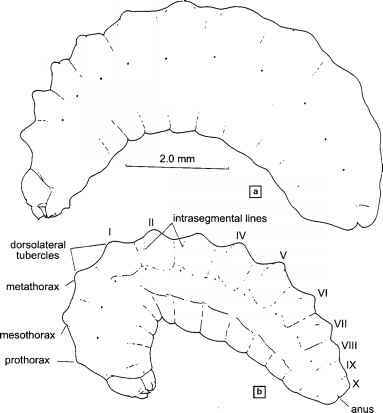 This finding and Phoebe's irregular orbital properties suggest to some scientists that the moon did not form in orbit around Saturn but was captured after having formed in a more distant orbit from the Sun, where temperatures and carbon-oxygen chemistry were different.